You know, that first couple weeks of being at home after my outsourcing was good times. I treated myself to homemade bacon and eggs, pancakes, fresh coffee, english muffins and fruit – sometimes all at once. Since then, I generally don’t indulge myself quite so much, for the reason portrayed in today’s comic. Specifically, treating oneself is just too much of a hassle with all the cleaning up that’s involved. While I’ll still crack an egg or fry up some spam, I generally try and do that stuff with limited utensils and in as short a time span as possible. I’ve extolled the virtues of cereal before, but it really is a miracle food. So sound off in the comments! : what’s your favorite cereal? That Princess Leia poll was pretty fun, so I might just take the top 10 cereals listed in the comments and put them to a new poll. My faves are Post Raisin Bran, Quaker granola and – while I don’t really dig the sugary stuff as much, I do like Frosted Flakes and Cinnamon Toast Crunch when I want to mix in something sweet. Your picks? oh and favorite cereal… hmm… grrrr….. ack… Porridge with brown sugar. hmm… never had sultana bran before, Ghost, but i do love porridge with brown sugar. yum! i sooooooo want to visit Australia, Ghost! you guys have the coOolest animals. i thought i cooked an awesome dinner tonight, Ghost, but i now have a stomach ache, so maybe it wasn’t so awesome. Porridge! Or, oatmeal, as you would probably call it. Personally I love some Quaker Granola with Raisins and just enough milk to not make it dry. When I think about it, without coffee I would probably never even survive the day. ALL HAIL THE MIGHTY COFFEE! COFFEE IS GOD!! My favourite cereal brand as a kid was always Rice Krispies. Just because it was the only cereal without extra sugar, and because I dont like chocolate tasting milk. cool. i’ll put Rice Krispies in the poll. In our house, the person who makes dinner doesn’t do the dishes, unless that person is only cooking for children who can’t reach the kitchen sink or don’t understand the concept of putting plates in the dishwasher _vertically_. Which are the days I order pizza. that’s a great law, Sarah W! it was followed in the Schuetze household until us kids moved out. another good law is if it’s your birthday, you don’t have to cook OR do dishes. i like that one a lot. I love me some golden grahams, sugar smacks and raisin bran. It all depends though. I’ll eat pretty much any of them. i haven’t gad Golden Grahams or Sugar Smacks in a looooong time, dj! but i used to love both. eating some Crunch Berries right now cuz a friend bought some for me. I don’t eat cereal the “intended” way because milk has a tendency to sap my energy. Not something I need right after I awake. However, there’s something to be said about Fruity Pebbles and Lucky Charms done up in marshmallow treat squares. mmm… i agree: Fruity Pebbles are awesome, Rainey (though i haven’t had any in years.) and i had a total craving a few years ago for Lucky Charms and mixed ’em in my Raisin Bran for a couple months. good stuff! Now my wife makes me breakfast and I clean up afterwards so, I guess I’m back to where I began, only my wife makes excellent breakfast, much better than mine. yep! glad you feel me, TPC. there was a great diner with cheap breakfasts right near me that i used to frequent all the time. unfortunately, it went under. but there’s still an IHOP within walking distance with ridiculously cheap breakfasts that do the trick if i’m craving pancakes/eggs/bacon/sausage. and i’m happy to hear your wife makes excellent breakfasts. at least you don’t have to clean and cook! I love stuff with marshmallows….Don’t judge me! yeah. so good, DK! i think that’s even Mombot’s favorite, or it was at one time. i need to pick some up; haven’t had it in forever. So, you’ve had something similar to sultana bran. We just call it raisin bran in the US. Oh! ill have to remember that when i finally go on that trip to the US. hope you have fun when you get here, Ghost. lots to see, lots to do! i agree that all of those are delicious, Hairball! i’ll add ’em to the poll. Just wash up immediately and it wont seem like a chore but as part of a meal. i try, Maryz, but more often than not, the dishes sit there for a couple hours. at least i (usually) don’t let ’em sit overnight anymore! hazelnut cereal!? i love hazelnut! specifically, what kind of hazelnut cereal? i want some now. Grape nuts, though I do add fruit to it..
i never really got into Grape Nuts, Satoshieyes, although my dad used to eat it. i’d always have to mix it into my other cereals to enjoy it. might have to give it another try now that i’m older. When I lived on my own I rarely made big or fancy meals for the same reason – I HATE doing dishes! For my cereal, Cheerios, Frosted Mini-Wheats and Frosted Flakes. We only had Cap’n Crunch the other morning so I had a bowl. WOW! Not as good as I remembered! haha Special K is good but not very filling. Oh, and Grape Nuts I really like! Have to let them sit in milk for awhile to soften up though (gee, I sound old… haha). I’ve always preferred apple jacks and rice krispies for my cereal needs. i had some Apple Jacks a year or two ago in one of those little boxes that come with a whole sampling of other cereals, 52pickup! pretty good, but not as good as i remember as a kid. i can still sing the song from the old commercials, though! My favorite cereals are Cocoa Crunchies(kind of like Cocoa Puffs) and Honey Nut Cheerios. Honey Nut Cheerios makes a good mixer, Fijman! and i haven’t had Cocoa Puffs in soooOOoo long, i can barely remember what they taste like! i wish i could get a little box of that, just to sample. Hope you had a good Thanksgiving yesterday. and oatmeal and brown sugar = deliciousness. Unfortunately, my wife and I are kind of “off” cereal at the moment, mostly because there just isn’t enough time for it most mornings. We’re very big Pop Tart / Nutragrain / breakfast bar people nowadays. that looks like a cool Kickstarter project! i’ll have to keep an eye on that one since it looks like they’re close to their goal. thanks for the tip. This is why they made industrial dishwashers, Jefbot! HAHA I feel the same way JB! I hate the cleanup so I usually stick to microwave :P.
As for favorite cereal…I am not too picky, but I LOVE to just let it soak for a little bit till it gets a bit soggy and then gobble it up! Its best if you just let it sit in the milk for about 5-10 minutes before even touching it… 😛 Miss ya bro!! i try not to do too much microwavin’, Nathan, cuz i fear the evil microwaves. miss ya, too, dude! we gotta do a movie or get some lunch soon. Grits or Cream of Wheat when it’s cold out, Grape Nuts when it’s not, assuming I’m eating breakfast with normal people at a normal time. Otherwise I wake up in time for a late lunch. The joys of being largely nocturnal! Wash the dishes as you use them, that’s how I do it. Deal with pans as they become available. i try doing that, Anime fan, and it does help a bit in that it’s not so overwhelming at the end, but the stuff that’s left is still annoying! heheh. I love to cook but cleaning is never my favorite thing especially since I live in a country where dishwashers are non-existent. When I wasn’t on my diet though, I usually cook different meals on a Sunday that serves 4-6, that way I can reheat them during the week. 😀 Less cleaning for me! Couldn’t Jefbot just ask him to help with the dishes…? I feel Bot’s pain! But I always wash the dishes before my mom comes home. I like plain cereal! I don’t like sugary stuff like fruit loops or frosted flakes. It tastes funny with milk. 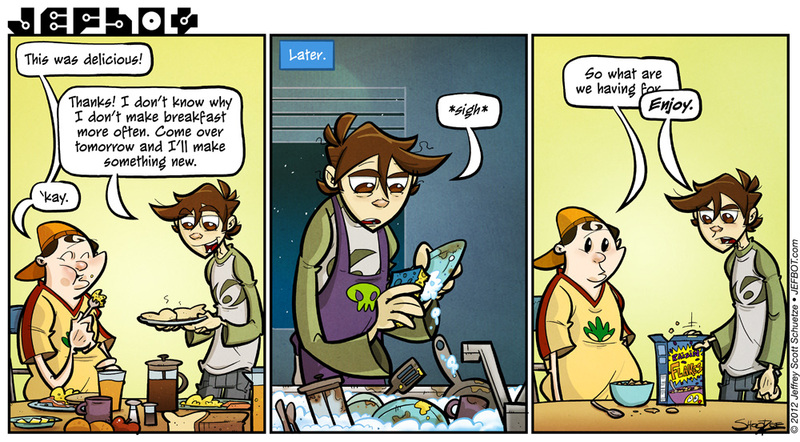 washing dishes before your mom comes home is probably a good plan to live by, Natalie! and i’m with ya with the plain cereal – although i oddly seem to have a few sugary cereals in my kitchen at the moment, i generally only use ’em to supplement my Raisin Bran and All Bran and such. Not really a cereal man. 1. Theyre expensive. 2. I feel bloated when i finish a bowl. 3. Id rather have egg n bacon for breakfast. Rice is cheaper where i live. 1 handful of rice n 1 litre of water makes 4 bowls of rice porridge. Add bovril n eggs and theyre heavenly. Add fried onion as substitute for msg. ya know, cereal is pretty expensive, Jf300! kinda annoying. i generally only get cereal when it’s on sale, which seems to be quite often at the local market. even then, it’s pretty expensive. and never made rice porridge but i might try to make some since i always have some rice sitting around. U should. Ur half blood demands it. i can feel the yearning, Jf300! Simple answer: BACON. The best kind of breakfast. Cereal though? Probably Golden Grahams, without milk, it’s very good. I enjoy the crap out of cooking, but I hate cleaning up after. Thankfully, my wife is okay with doing the dishes in exchange for my doing the cooking, so yay for that. I make a mean stir fry, fried chicken, stuffed hamburger, and pasta salad. Not all at the same time of course. I also make pretty awesome dessert pancakes. having that cook/clean trade-off with your wife is a great way to lessen the burden, E. A. Setser! and sounds like you’re quite a cook. i make a mean bowl of cereal and toast. I also cater movie shoots. Not that I’ve done it before, but I would if offered the gig. HINT HINT. Haha. Forget cereal. The real miracle is a dishwasher. Lucky Charms has and always will be a favorite. I did recently discover dulce de leche Cheerios. Those were fantastic! i saw those Dulce de Leche Cheerios, TCG, and was wondering if they were any good! (i’m a Honey Nut Cheerios fan.) i’ll give ’em a try the next time they go on sale. have you tried the Chocolate Cheerios? I have no good sir. Don’t think I’ve seen them yet. they pop up in the supermarket near me every now and then. i just don’t want to have to eat an entire box if they’re mediocre. Cleaning dishies are fun! You just need the right motivation! Did I just type dishies…. Ya, and Da Shes are really fun. As if I ever knew that. . . . . Maybe Jefbot can give geekdom a few pointers, since he’s famous. Besides, what ever happened to the arcade girl? “dishies” sound much more fun to do than just regular “dishes,” ROM! heheh. so what motivation do you use to make the process fun? My roommate’s dad work at General Mills, so we sometimes get new flavors of cereal a week before the grocery stores first stock them. Our most recent was Apple Cinnamon Chex. Earios, just pour the milk and it just lays there. My kitchen looks like a nuclear blast went off whenever I cook something so I feel ya’. I wouldn’t keep cooking except it’s one of the ways I de-stress. Don’t serve food from the table. Put all dishes on the counter and serve buffet style. Do not serve from any pots/pans, put the food on plates to serve. Rinse out the pots/pans as soon as you move the food over. As soon as a plate is empty, rinse it out quickly in the sink. This gets things “cleanish” before any food can harden, which means you can just throw everything into the dishwasher and it’ll be immaculate later.